Eltronicschool. - This is one application of the MPC3PHAC IC from NXP semiconductor to build 3 phase AC motor controller circuit schematic look like shown in Figure 1. 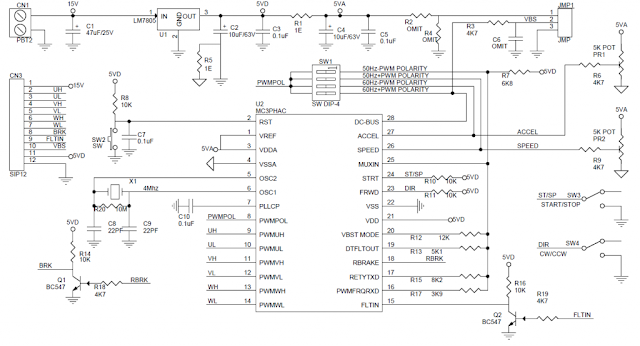 Using this circuit schematic you will perform 6 PWM signals for 3 Phase AC Motor controller. It’s very easy to make professional VFD combining with Intelligent Power Module (IPM) or 3 Phase IGBT/MOSFET with Gate driver. Circuit schematic like in Figure 1 above is 3 Phase AC Motor Controller Based on MC3PHAC from NXP Semiconductor. Accordingly Electronics-hub site that published this circuit describe that the MC3PHAC is a high-performance monolithic intelligent motor controller designed specifically to meet the requirements for low-cost, variable-speed, 3-phase ac motor control systems. The device is adaptable and configurable, based on its environment. It contains all of the active functions required to implement the control portion of an open loop, 3-phase ac motor drive. One of the unique aspects of this board is that although it is adaptable and configurable based on its environment, it does not require any software development. This makes the MC3PHAC a perfect fit for customer applications requiring ac motor control but with limited or no software resources available. Included in the MC3PHAC are protective features consisting of dc bus voltage monitoring and a system fault input that will immediately disable the PWM module upon detection of a system fault. All outputs are TTL signals, Input supply 5-15V DC, DC Bus voltage should be between 1.75V-4.75V, Dip switch provided to set the motor frequency 60 or 50 Hz, jumpers also helps to set the polarity of the output PWM Active Low or Active High and this helps to use this board with any kind of IPM modules since output can be set active low or high. Potentiometer PR2 helps to adjust motor speed. Refer to datasheet of the IC to change base frequency, PWM Dead Time, other possible parameters. Speed Control — the synchronous motor frequency can be specified in real time to be any value from 1 Hz to 128 Hz by adjusting the PR2 potentiometer. The scaling factor is 25.6 Hz per volt. The SPEED pin is processed by a 24-bit digital filter to enhance the speed stability in noisy environments. Acceleration Control — Motor acceleration can be specified in real time to be in the range from 0.5 Hz/second, ranging to 128 Hz/second, by adjusting the PR1 potentiometer. The scaling factor is 25.6 Hz/second per volt. Fault Protection: The MC3PHAC supports an elaborate range of fault protection and prevention features. If a fault does occur, the MC3PHAC immediately disables the PWMs and waits until the fault condition is cleared before starting a timer to re-enable the PWMs. Refer to the graph in Figure 10 for the resistance value versus retry time from data sheet of the IC. Figure 10 assumes a 6.8 kΩ pull up resistor. In standalone mode, this timeout interval is specified during the initialization phase by supplying a voltage to the MUX_IN pin while the RETRY_TxD pin is being driven low. In this way, the retry time can be specified from 1 to 60 seconds, with a scaling factor of 12 seconds per volt.